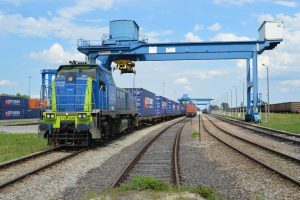 PKP Cargo has received PLN 300 million (EUR 69.4 million) under the Operational Programme Infrastructure and Environment 2014-2020 to develop three intermodal projects. The funds will cover half of the planned investment for all projects to be implemented. PKP Cargo will carry out two projects that envisages the acquisition of multi-system locomotives and wagons which will be used for intermodal transport services. For these two projects, PKP Cargo received PLN 92.4 million (EUR 21.4 million). For the acquisition of intermodal platforms, PKP Cargo was awarded PLN 183.5 million (EUR 42.5 million). Another project that received EU financing involves PKP Cargo Malaszewicze Logistic Centre which envisages the modernisation and extension of the intermodal terminal, including the acquisition of the necessary equipment. For the implementation of this project, PLN 12.8 million (EUR 2.96 million) were allotted from the EU funds. PKP Cargo Malaszewicze has 4 fully functional terminals which allow handling both unitized and mass cargo. “We are pleased that the projects submitted by PKP Cargo have been positively evaluated. The co-financing obtained will help us to implement the Group’s development strategy, with one of the priorities being the development of intermodal transport in Poland and abroad. This sector of rail transport is developing very dynamically, and clients will certainly order more and more intermodal services. That is why we are preparing a terminal in Małaszewicze to accept a larger stream of containers transported between China and the European Union as part of the New Silk Road,” Czesław Warsewicz, president of PKP Cargo said. We remind you that in September, PKP Cargo has launched the tender for the purchase of 936 flat wagons which will be used for the transport of containers. In October, the rail freight operator published a Request for Proposal on the acquisition of new four or six-axle electric locomotives. Recently, with Newag, PKP Cargo signed a EUR 10.5 million contract for the supply of three six-axle Dragon 2 locomotives.